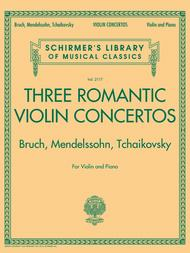 Schirmer Library of Classics Volume 2117 for Violin and Piano. Composed by Max Bruch (1838-1920), Felix Bartholdy Mendelssohn (1809-1847), and Peter Ilyich Tchaikovsky (1840-1893). String. Classical. Softcover. 176 pages. G. Schirmer #LB2117. Published by G. Schirmer (HL.50600111). ISBN 1495010422. 9x12 inches. Schirmer's Library of Musical Classics Vol. 2117. 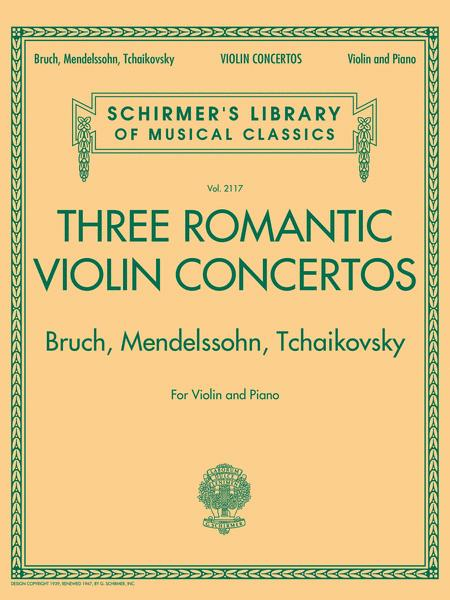 Three of the most beloved violin concertos from the Romantic era, combined into a convenient and affordable collection. These repertoire staples belong in every violinist's music library. Includes: Bruch's Concerto for Violin in G minor, Op. 26, Mendelssohn's Concerto for Violin in E minor, Op. 64, and Tchaikovsky's Concerto in D Major, Op. 35.